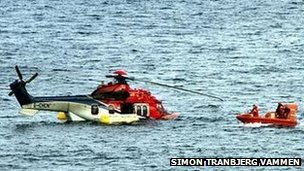 The helicopter crash off Shetland which claimed the lives of four people has once again raised safety concerns. The RMT union said it anticipated "an outpouring of anger", following the fifth major North Sea incident involving a Super Puma since 2009. On Saturday, a helicopter safety group recommended all Super Puma UK offshore commercial passenger flights be temporarily suspended. Earlier, CHC Helicopter suspended all Super Puma AS332L2 operations. The same model was involved in a North Sea crash in April 2009 which killed all 14 passengers and two crew on board. Its gearbox failed while carrying the men to Aberdeen. A different Super Puma model - the EC225 - has been involved in three separate incidents since 2009. Passengers and crew all survived when a Bond-operated EC225 went down east of Aberdeen in February 2009. Last year, the EC225 was involved in two separate ditchings in the North Sea. All passengers and crew were rescued in both incidents, which were found to be caused by gearbox problems. Reacting to Friday's incident, RMT general secretary Bob Crow said: "Workforce confidence in the Super Puma type aircraft was severely dented after the two ditching events of last year and the fatal accident in 2009. "RMT and Unite have worked with all sectors of the industry to address the concerns of our members and rebuild that confidence. "Last night's events have undone all of that work and we anticipate an outpouring of anger." He added: "The entire Super Puma fleet must remain grounded until the causes of this latest event are established and dealt with thoroughly to the union's satisfaction, and we will support any member who refuses to board any suspect aircraft type in light of this disaster." Speaking after the latest incident, Mark Abbey, from CHC Helicopter, expressed "heartfelt sympathies" to all those involved in the crash. He said: "Following the incident, flights in Aberdeen have been suspended today as a mark of respect for the events of yesterday. "Globally, we have temporarily suspended operations of all AS332L2 aircraft until more information is available." Mr Abbey continued: "CHC will not enter into any speculation as to what caused the incident but rest assured a full investigation will be carried out in which we will co-operate fully with all the regulatory bodies and share any learnings with the industry. "We are proud of our partnership with the industry and, like all helicopter operators, we have advanced considerably in terms of technology and predictability and the safe-guards we put in place to mitigate risk. "However in a tragedy like this, none of that matters. "What does matter is that while it is not possible to take all of the risk out of this industry it is our obligation to mitigate those risks and be as safe as we possibly can be." Another operator, Bond Offshore Helicopters, has also halted operations of its Super Puma fleet. In a statement it said: "We would like to express our deepest sympathy for all those affected by the tragic accident to the CHC Scotia operated AS332L2 yesterday. "At this time, and until further information becomes available, Bond Offshore Helicopters will not be operating any of its Super Puma aircraft fleet, with the exception of our Jigsaw rescue aircraft which will be available for life-at-risk missions. "All other flight operations continue as scheduled." Tim Ripley, an aviation expert with Jane's Defence Weekly, told the BBC there were "many possible scenarios" behind the helicopter crash. He said: "The most common one at low level for aircraft and helicopters is bird strikes. "If one of these helicopters ingested a bird it would cause a very, very nasty accident. "But it doesn't seem like that because we have no reports of collisions, which points towards a failure of the engine and the mechanical systems on the helicopter."